Elastically scattered light contains information about the scattering medium with which it has interacted. The elastic scattering process can be interpreted as a change in the momentum of light due to its interaction with a scattering object. By analyzing this change in momentum, structural information such as the size, shape and organization of scattering objects can be recovered. 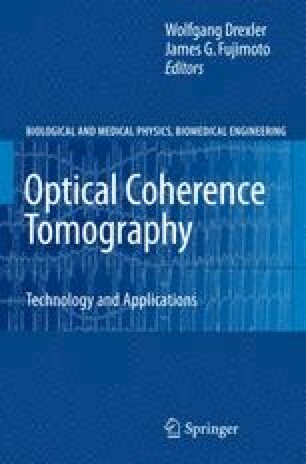 Recently, light scattering techniques have been developed for examining biological cells and tissues both in the laboratory and the clinic. These techniques are broadly termed elastic scattering spectroscopy (ESS). In this chapter, the development of cell and tissue analysis methods based on the combination of ESS and OCT are discussed. Background information consisting of an overview of the advantages and theoretical basis of ESS is presented first. This is followed by a survey of ESS schemes which employ coherence gating to isolate photons which have scattered once. Finally, a review of recent experimental results which use combinations of ESS and OCT methods is presented, including basic validation experiments, studies of in vitro cells and pre-clinical studies of ex vivo tissues.